Published with Johns Hopkins University Press in Fall 2013, Amish Quilts: Crafting an American Icon takes a wide-angle view of Amish quilts from their 19th-century origins within Amish homes, to their gallery debut in 1970s New York City, to their role as a newfangled cash-crop in Amish settlements, to their status as commodities within global markets. With over 100 high quality color images, the book is a visual treat, serving as inspiration for artists and quiltmakers, and as a great addition to your coffee table. 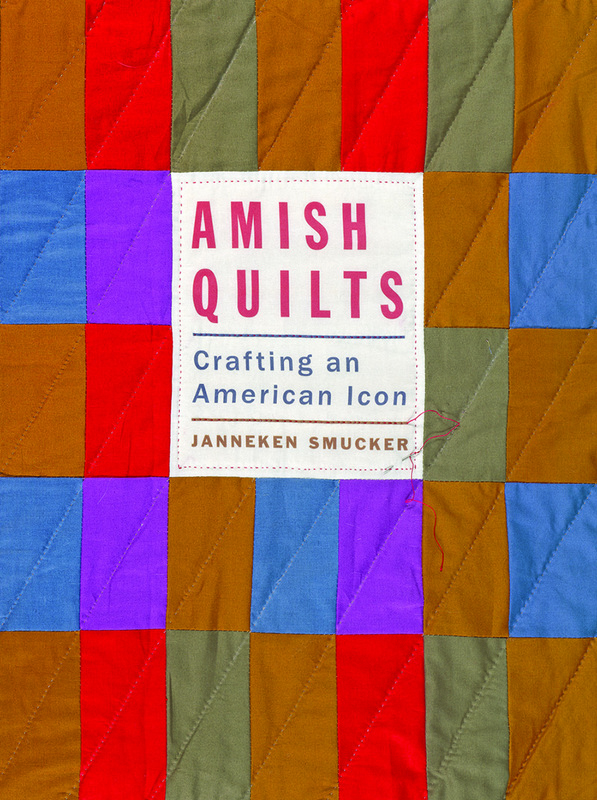 By exploring the relationship of Amish quilts to the individuals who made, bought, sold, exhibited, and preserved them during the last half of the twentieth century, this book investigates intersections of art, craft, fashion, globalization, religion, ethnicity, and consumer culture. I argue that both Amish and non-Amish individuals, influenced by understandings of theology, Modernism, connoisseurship, nostalgia, “Amishness,” consumerism, and authenticity, crafted the value of Amish quilts during this era. This value was of course monetary, but also aesthetic, emotional, and cultural. Although aspects of this story are relatively recent history, I tell it with an historical approach following a loosely chronological narrative. I examine how these bedcovers—once solely objects made and used in Amish homes—emerged within 19th-century Amish homes in the midst of the industrial revolution and colonial revival, and then became first works of art worth a lot of money and second, commodities made in home-based Amish industries and sold to tourists. I use historical analysis of archival and published sources, examination of quilts, and oral history interviews to tell this story. “This book is a landmark not only in the field of quilt history but also in American social history, The author traces the cultural biography of Amish quilts from the hands of their makers to the hands of their collectors, with many stops in between. The extraordinary color plates reveal the beauty of Amish quilts, while the impeccably researched text reveals the complexity of this craft tradition.” — Janet Berlo, University of Rochester, author of Quilting Lessons (2001) and co-editor of Wild by Design: Two Hundred Years of Innovation and Artistry in American Quilts (2003). Art Libraries Society of North America, Reviews, March 2014: ” Janneken Smucker deepens our understanding of these celebrated handicrafts and successfully demonstrates the far-reaching importance of their cultural impact…. While this volume is not meant to serve as a coffee-table picture book, its text is balanced with a generous and valuable amount of high-quality images that will surely grab the attention of academic and pleasure readers alike. Smucker’s engaging writing style and keen sense of American history and consumerism makes this book suitable for academic libraries that service art and fashion programs, textile collections and museums, and public repositories in communities where craft is integral to daily life.” ~ Joe Festa, Manuscript Reference Librarian, Patricia D. Klingenstein Library, New-York Historical Society. Mennonite World Review, March 31, 2014: “Meticulously-researched…. Smucker’s findings help to erode stereotypes about the Amish. She argues that while well-known emphases such as community-mindedness, humility and thriftiness are central to the story of Amish quiltmaking culture, so too are individual initiative, negotiation and business savvy.” ~ Rachel Waltner Goossen, Washburn University. First Things, May 2014: “The story of the rise of Amish quilts tells us more about the values of the art world than it does about the Amish. Yet it is a story that reminds us that constraint fosters creativity, and scarcity creates desire.” ~ Betsy Childs, Beeson Divinity School. Choice, June 2014: “Smucker (West Chester Univ. ), textile historian, quilter, and Mennonite (with Amish forebears), asks the question ‘What makes an Amish quilt Amish?’ at the beginning and end of this fascinating, well-researched book. One realizes that the answer is ambiguous and depends on the perspective of the persons asking it, be they quilt makers, retailers, dealers, collectors, or curators…. It is handsomely and colorfully designed, playing on the theme of Amish quilts. Summing Up: Highly recommended. Upper-division undergraduates and above; general readers.” ~N. J. Quinlan, Nova Southeastern University.